A few weeks ago I was on my way down to Bakersfield for the California Hot Rod Reunion, when I dropped by a truck stop for a quick snack break. If you’ve ever been to one of these roadside megastores you know they sell all sorts of strange stuff. Whether you need a corn dog, a CB radio, or a patriotic t-shirt, they’ve got you covered. They also have a selection of diecast cars, and that’s where I first saw the Hot Wheels Vintage Racing series. 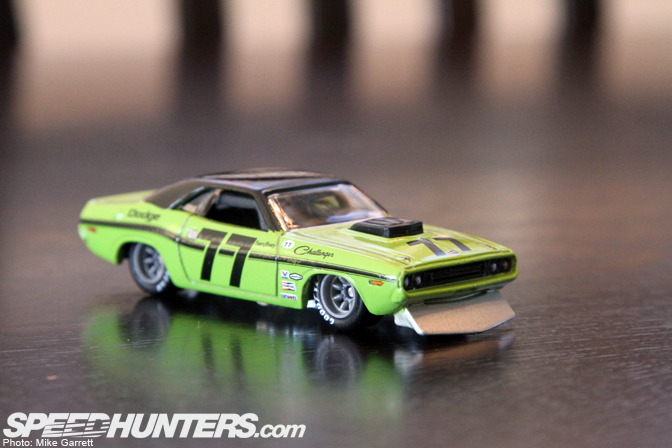 The series features 30 different race cars from the ’60s and ’70s – stock cars, drag cars, and road racers. 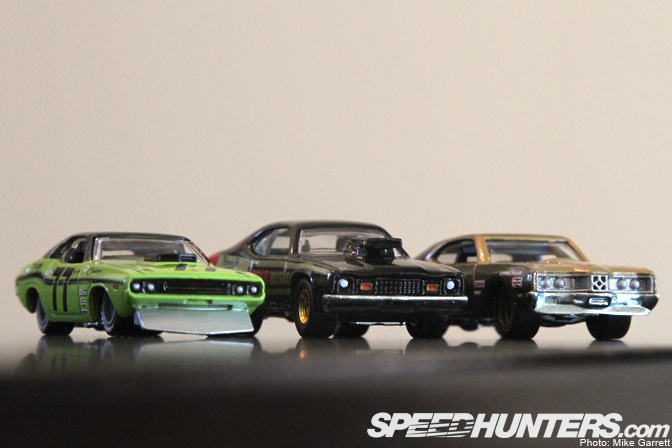 They are all 1/64 scale(ish), most are based on existing Hot Wheels models, with a few new toolings thrown in. 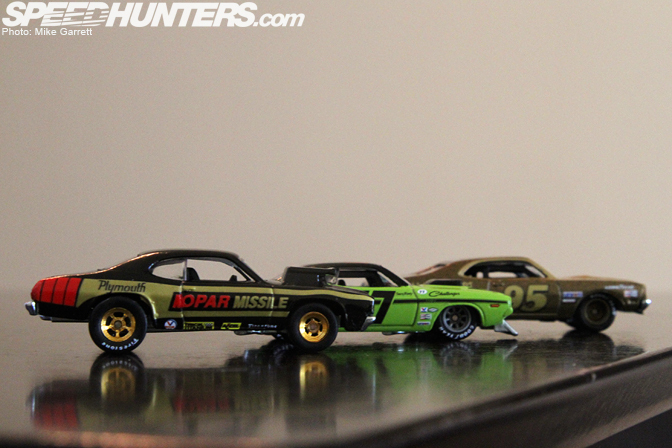 There were a few different cars on the shelf at the truck stop, and I came home with three of them. At just $3.00 each, they were pretty easy on the wallet. I know most real Hot Wheel collectors like to leave their cars in the packages, but I opened mine up as soon I was done taking these photos. I suppose that’s the kid in me. 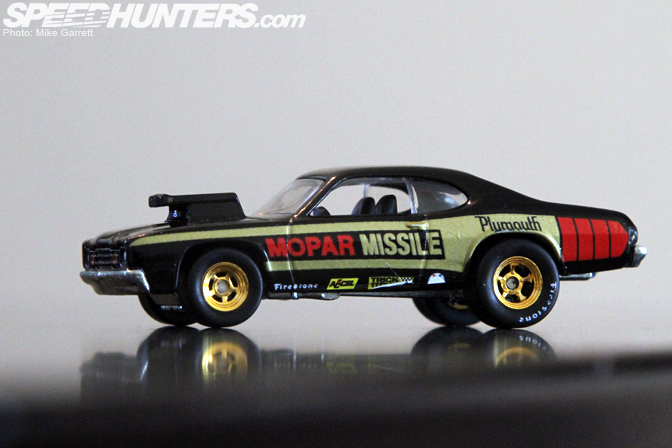 Among the trio of cars I picked out was the Mopar Missile Pro Stock Duster. 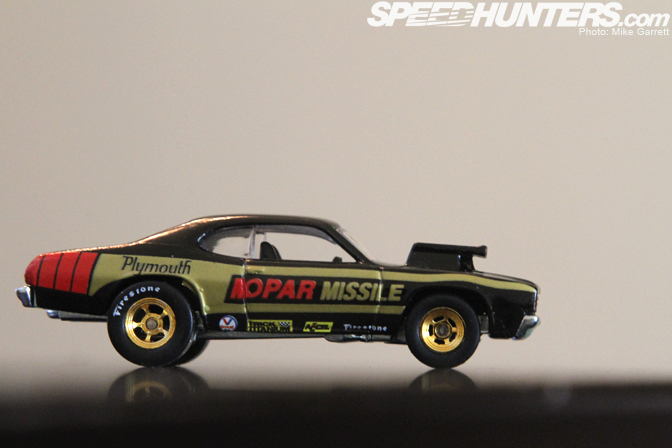 It’s surprisingly detailed for something based on a normal a Hot Wheel. It even has the correct gold mag wheels. Classic NASCAR is represented well in the Vintage Racing series. This is Darrell Waltrip’s Mercury Cyclone. It’s replica of the car that DW drove in his first Winston Cup race in 1972. 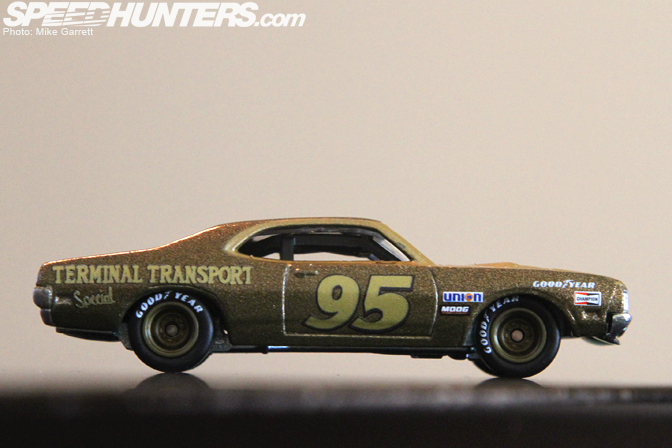 Last, but not least we have Sam Posey’s Trans Am Challenger from 1970. This is one of my favorite race cars ever. I spotlighted the real version a few months ago. 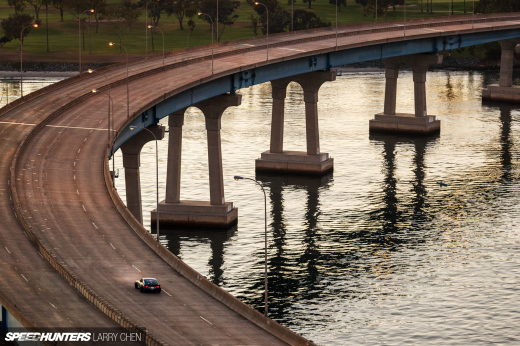 They did a nice job capturing the car’s giant front air dam! One more group shot. Can you feel the history? 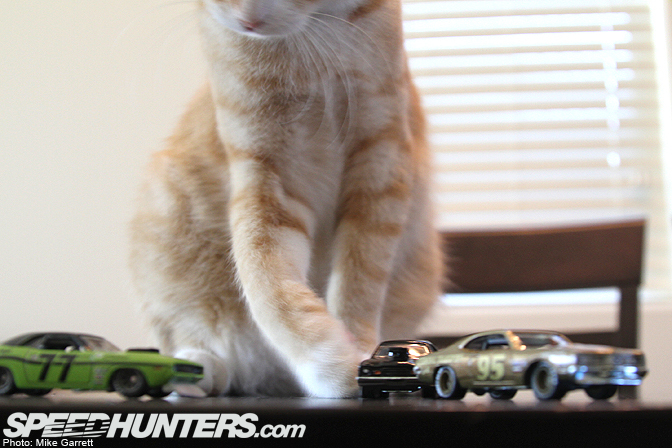 Just as I was wrapping up this once in a life time photoshoot, a gigantic cat jumped on the table and pushed the historic race cars around…as if they were toys or something. After narrowly escaping the feline attack, I parked the cars in their new home overlooking my desk. 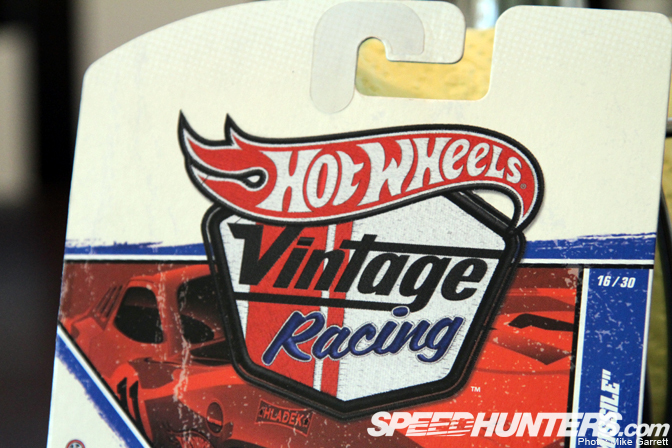 Now I’m on the hunt to track down more cars from the Hot Wheels Vintage Racing series. I know there’s a BRE Datsun 510 out there with my name on it! OMG I WANT THIS!!!! Wonder if they have some retro Petty and Earnhardt cars! Yes, lots of petty cars, but no Earnhardt cars!! 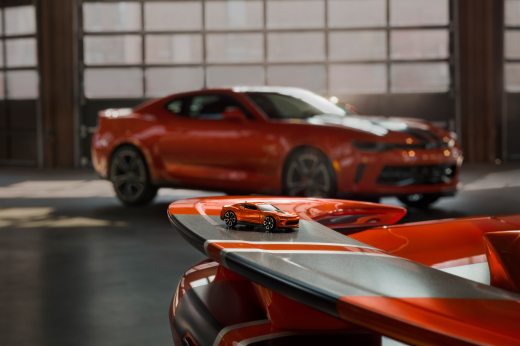 I see a blurry Hot Wheels Nissan GTR in the background! Desktop and name of of cat? Mercury cyclone! 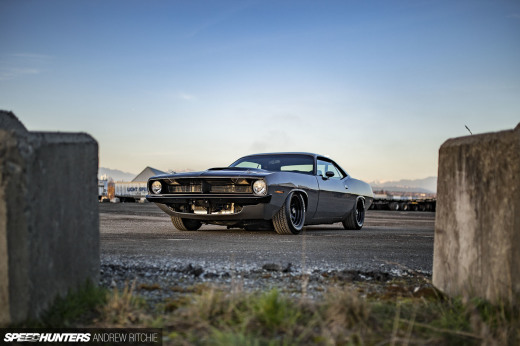 - pro am challenger!- Pro stock duster! oh good grief this is fantastic! 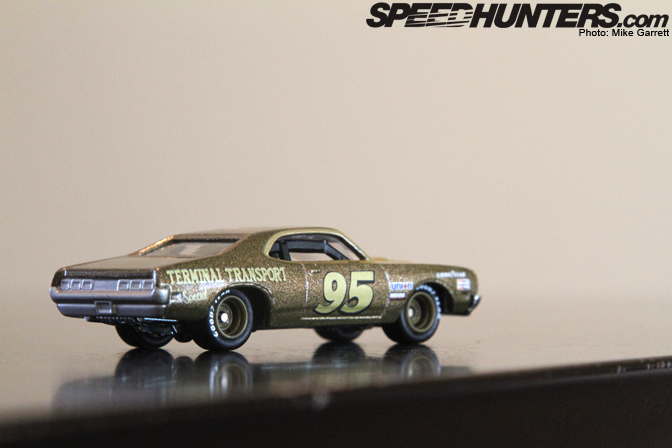 i cant buy any more die cast cars i never finish my real cars! .. SO.......... how much for the set?.. 3$ each? Compared to the 75$+ die-cast models from the Nurburgring shop, these are bargains! And you can play with them too! BRE 510 will get it's own feature, right? More pictars of the Tamiya MX-5 model please! I saw the box in the background of the last pic, love my Tamiya's! 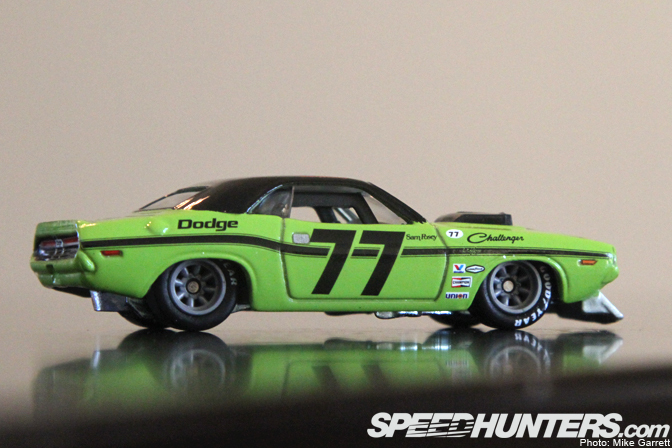 I picked up Petty's Superbird just last week. I know there are some of Petty's old cars but that Datsun 510 is calling my name aswell. They might be the coolest Hot Wheels I have seen yet. Mike, thanks for covering our product. If you ever want to talk Hot Wheels, let me know! And thanks for spotlighting my green 510 wagon earlier this year! Hot Wheels are tricky to collect. The ones you find in Walmart/Target are pretty low quality with paint/sticker mistakes. At around $1 a piece, you get what you pay for. These Collector Series ones are worth the extra money, and you can even order them directly from Mattel. 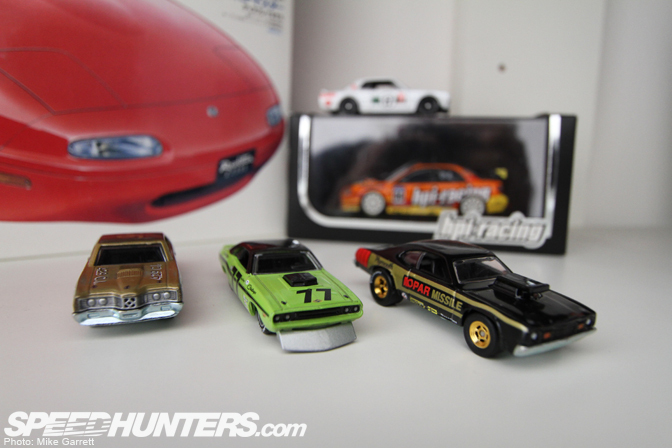 I have the Hakosuka model in the background of the last pic! It's beautiful. I still can't find that damn KGC10! Love me some Hot Wheels. Thanks for feeding the addiction, Mike. An extra-ordinary tips providing in this post. I like very much this post because it is easy in understanding. In advanced it also contains the sites for getting the more information. 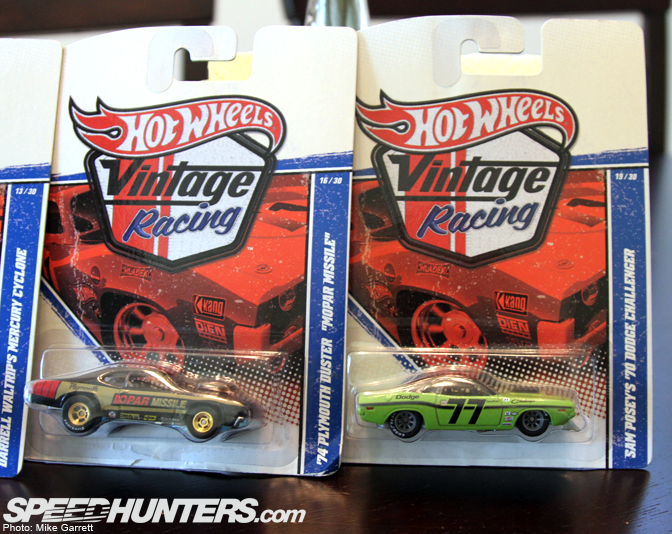 The BRE 510 is the same hotwheels 510 with a new paint scheme and much better wheels. 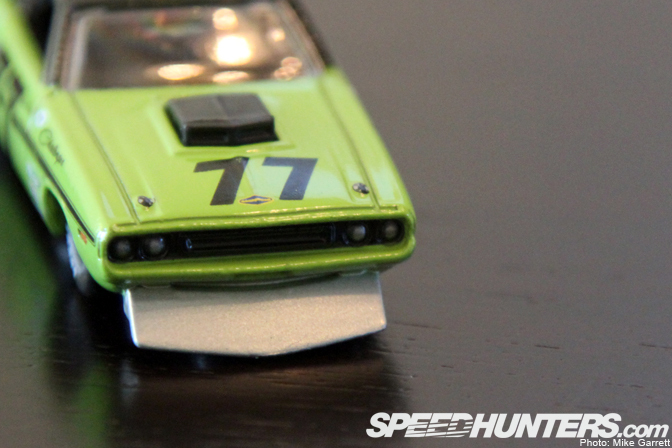 The Petty 72-ish Roadrunner looks more 'right' than the Superbird. I have already spent way too much on the vintage series and othe hot wheels. Did you know they have a 60s Sting Ray concept. AWESOME!!!! 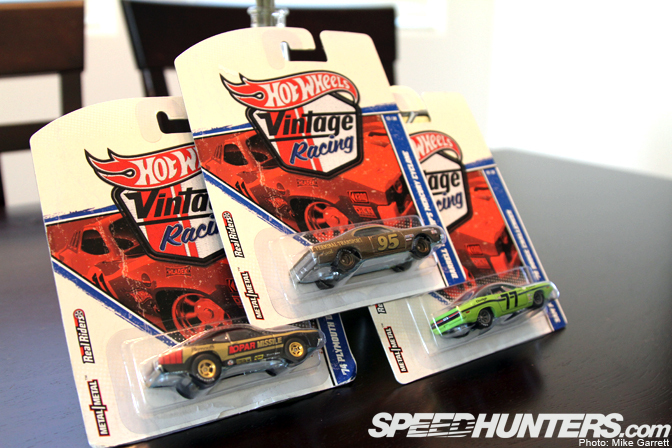 FYI, Target and some Walmarts don't stock the Vintage Racing Series. I copped two BRE 510s at KMart in the SGV today...Toys R Us and even Ralphs/Krogers also carry the line, though usually they're behind on the releases. Cool set, I must pick up some of them. Hello,My name is Stephanie Henderson,I have a Hot Wheel car .It's # 32 car. Dont know if its an original,or if it has value. Just wanted to share this info with you. What year do the cars have to be to be worth money. I have lots of cars been collecting for a long time. I have 1 that the date on the bottom says 1902 trying to find some information about it.